Punitive Damages in Iowa Personal Injury Cases | Hupy and Abraham, S.C.
Are punitive damages possible in an Iowa personal injury case? 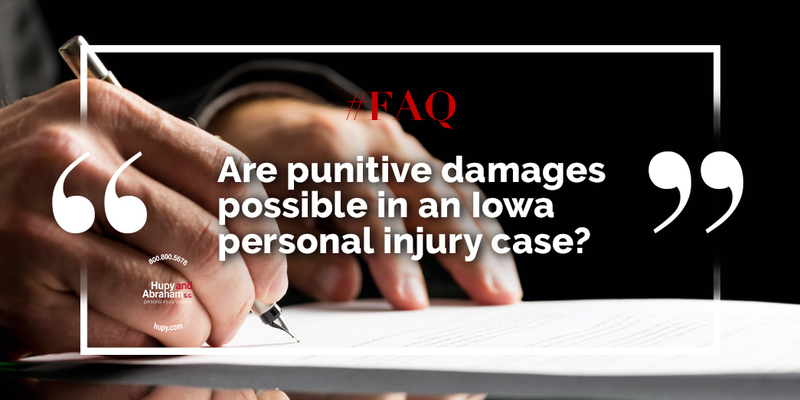 Chapter 668A of the Iowa Code allows punitive damages (also known as exemplary damages) to be awarded in some personal injury cases. Punitive damages are awarded far less frequently than compensatory damages, and they serve a different purpose. While compensatory damages are meant to compensate the person who was hurt for things such as medical expenses, lost income, pain, suffering, and other losses, punitive damages are meant to punish the defendant. The law only allows this type of punishment in certain situations. Whether the defendant’s conduct that caused the injury was done with “willful and wanton disregard for the rights or safety of another.” This must be proven “by a preponderance of clear, convincing, and satisfactory evidence”—a standard that is much higher than is required to prove compensatory damages in an Iowa personal injury case. Punitive damages may only be awarded if this standard is met. Whether the defendant’s conduct was directed at the person who was hurt. If the defendant’s conduct was directed at the person who was hurt, then the full amount of punitive damages may be awarded. If, however, the defendant’s conduct was not directed at the person who was hurt, but an injury happened anyway, then the plaintiff may recover up to 25% of the punitive damages awarded, with the rest going into a state trust fund. Punitive damages can serve two important public policies. First, they can punish the defendant for extreme wrongdoing. Second, they can deter others from acting in a similar way and from hurting other people in the future. For these reasons, it is important to speak with an experienced Iowa personal injury lawyer as soon as possible about protecting your rights and getting all of the damages you deserve after an Iowa accident. Contact us online or call us directly at 800.800.5678 to schedule your free, confidential consultation today.